Having heard yet more rumours of a potential takeover in the past couple of days, the visiting fans at least had something tangible to take home. Most of the early initiative had been with Everton, who handed Ademola Lookman a first league start of the season and recalled Tosun up front. With Andre Gomes pulling the strings and Lucas Digne threatening out wide, the hosts largely controlled the game and created the best chances but Newcastle, despite focusing on defence, did create the odd opportunity. Rondon was a handful on the break and the visitors threatened first when Jamaal Lascelles headed wide from a dangerously whipped in Ki Sung-yeung free-kick. Everton's first chance came as Tosun headed over while Richarlison had a shot blocked by Fabian Schar. The Magpies grabbed the lead against the run of play in the 19th minute after Jacob Murphy beat Seamus Coleman on the left to curl in a low cross. Rondon slid in at the back post to finish. Everton almost responded immediately as Dubravka saved from Digne and Richarlison had a shot blocked. Lookman fired over and Sigurdsson was denied by a brilliant block from Fernandez as he looked certain to score from a great Digne cross. 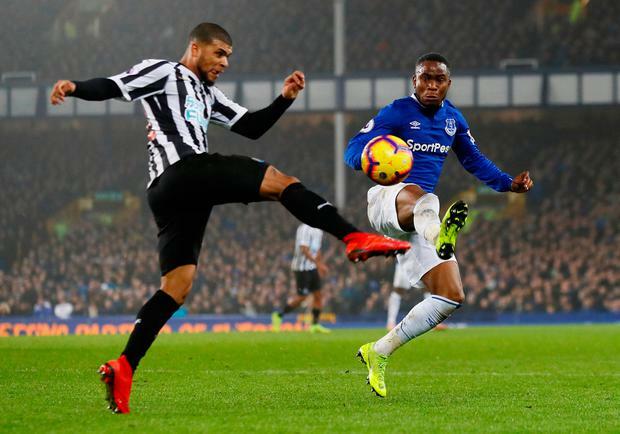 Rondon missed the target as Newcastle broke again but chances continued to come for Everton. It took a brilliant save from Dubravka to prevent Everton taking the lead before the break, the Slovakian diving to his left to deny Tosun at point-blank range from another fine Digne cross. Theo Walcott should have done better after being sent clear by a long punt from Jordan Pickford - who had received a great reception from the home fans after his costly error against Liverpool - following a Newcastle corner. The former Arsenal forward looked through on goal when he miscontrolled and allowed Newcastle to recover.